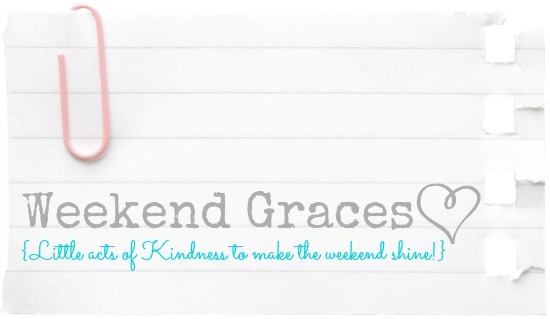 Weekend Graces is a (sorta) weekly challenge to find simple ways to bless your family this weekend. They are small things that speak volumes of love. My own family has been so blessed by these small acts. This week's Weekend Grace is to assemble a s'mores basket. I filled a basket with graham crackers, marshmallows, three different types of chocolate, and some moist towelettes for cleaning sticky fingers! If you don't have a fire pit... you could still make a happy little basket to bless your family. Maybe you could fill it with small bottles of bubbles, a pack of sparklers, candy necklaces, a new frisbee....anything that will get your family excited to spend some time outdoors together this weekend! Thanks so much for visiting The Complete Guide to Imperfect Homemaking. Have a fabulous Weekend! Well, we still have snow here in the middle of April! I might make an indoor smore kit though. Love this... and makes me wish we had a fire pit! No yard here in Sicily for us, however. We do have a beautiful "hobbity" fireplace, though, and I know one little 2-year-old who would think s'mores a very great grace to her! Such a great idea! I am so glad I began following your page! Your blog has been a real blessing & you really opened my eyes to just how important my relationship with The Lord is & the need to spend time with him on a daily basis (what a difference it makes!) and inspired me to simplify our life, get organized, paint things teal (I share your love for that color! ), and to enjoy this time with my kids, no matter how frustrating it can be at times, and to bless my husband when I have the chance! Love this blog! <3 Thank you! Here its spring. But cold. I love the idea of the basket. I shared your lovely blog with my sister. She loves it as my I as I do. Lucky for me, this weekend my daughter and I went to her home, her husband started a fire in a backyard fireplace and we made smores!!! It was inspired by your post. Thank you for the tip. It was a memoriable weekend! I just stumbled across this series and absolutely love it! It's so easy to get busy and forget about just being together. Thank you for this reminder! I am planning an extra special weekend grace for this weekend! All my boys will love it! !